Hohman TJ, Bush WS, Jiang L, Brown-Gentry KD, Torstenson ES, Dudek SM, Mukherjee S, Naj A, Kunkle BW, Ritchie MD, Martin ER, Schellenberg GD, Mayeux R, Farrer LA, Pericak-Vance MA, Haines JL, Thornton-Wells TA, ,. Late-onset Alzheimer disease (AD) has a complex genetic etiology, involving locus heterogeneity, polygenic inheritance, and gene-gene interactions; however, the investigation of interactions in recent genome-wide association studies has been limited. 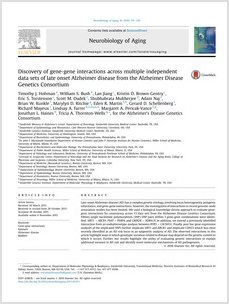 We used a biological knowledge-driven approach to evaluate gene-gene interactions for consistency across 13 data sets from the Alzheimer Disease Genetics Consortium. Fifteen single nucleotide polymorphism (SNP)-SNP pairs within 3 gene-gene combinations were identified: SIRT1 ABCB1, PSAP PEBP4, and GRIN2B ADRA1A. In addition, we extend a previously identified interaction from an endophenotype analysis between RYR3 CACNA1C. Finally, post hoc gene expression analyses of the implicated SNPs further implicate SIRT1 and ABCB1, and implicate CDH23 which was most recently identified as an AD risk locus in an epigenetic analysis of AD. The observed interactions in this article highlight ways in which genotypic variation related to disease may depend on the genetic context in which it occurs. Further, our results highlight the utility of evaluating genetic interactions to explain additional variance in AD risk and identify novel molecular mechanisms of AD pathogenesis. Posted in Publications, Will Bush.